Hey Guys, I'm Sailor Mars! A bit about me: I love romance, my friends, my Grandpa, relaxing and going out. I spend a lot of time fighting with that meatball-head Serena. I go to a private school and live in a temple with my nutty Grandpa. I'm usually pretty demanding, but when push comes to shove I'm always ready to work alongside my friends...well, most of the time. 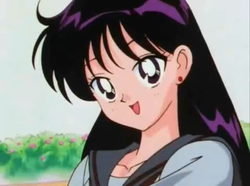 I've got a cool secret; I'm also the heroine Sailor Mars! I'm a pyromancer (or a fire warrior) sworn to fight on behalf of the planet Mars.